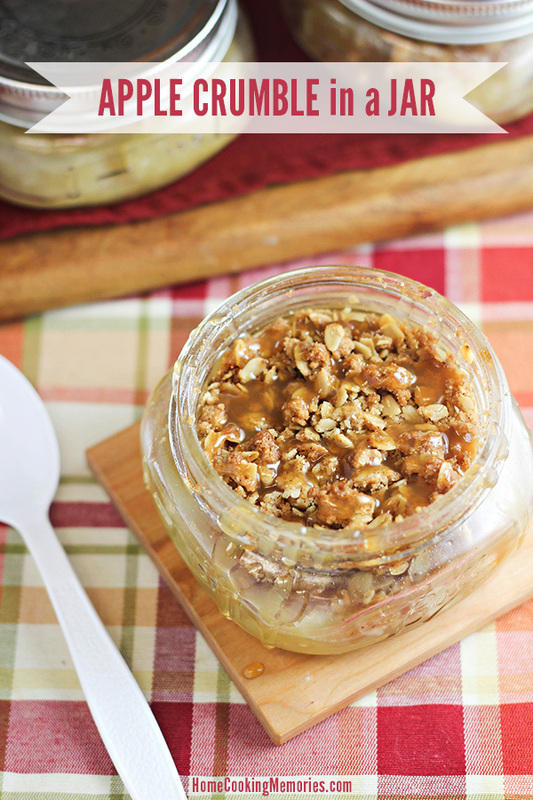 This Apple Crumble Dessert in a Jar is an easy apple dessert, made right inside of mason jars. 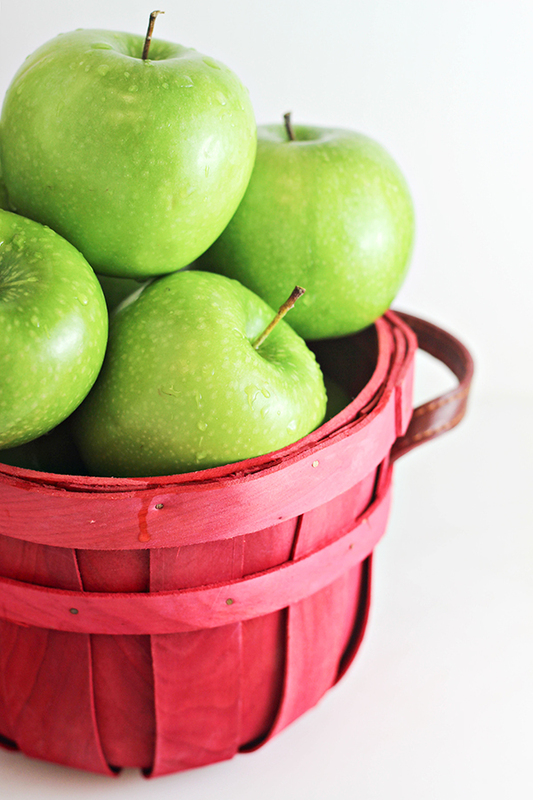 Do you know the difference between an apple crumble, an apple crisp, and an apple cobbler? There is a small part of me that doesn’t care. I’ve always been a fan of baked apple desserts — including the king of all: apple pie. I’m quite happy to eat them all. But the bigger part of me that is always questioning and seeking answers and I wanted to know. I did some investigating and found that there is actually isn’t much difference between all of my favorite apple desserts. Apple crumble has a crumbled streusel topping that includes oats. Apple crisp has a crumbled streusel topping without oats. Apple cobbler is topped with biscuits, instead of a streusel. For years, I was thinking that I liked apple crisp the most. I always called the baked apple dessert I made an “apple crisp”. But, now I realize that it’s actually apple crumble, because I almost always use oats in my streusel. Most of the time, Apple Crumbles are made in one baking dish. Doing it that way is easy and has the valuable benefit of leaving only one dish to clean. 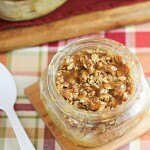 However, for this Apple Crumble recipe, I decided to make it in individual mason jars. Making them in a jar is also easy, but it adds an extra element of fun. Our guests are always impressed when they are presented with a dessert in a jar, which I think makes the dessert even more memorable. To make this Apple Crumble recipe, you’ll need only a few ingredients, including apples. I like to go with Granny Smith apples for this because I like their tartness with the sweet streusel. I picked up my Granny Smith apples at the farmer-picked Walmart Produce department, where they offer a 100% money back guarantee on all produce they sell. If you aren’t happy, just bring back your purchase and they will refund your money, no questions asked. I was very happy with my apples, so no chance they were going back! The apples from the Walmart Produce department are peeled, cored, and sliced, and tossed with some lemon juice and brown sugar. They are packed into the bottom of 8 wide-mouth half-pint canning jars. The streusal topping — which consists of oats, flour, brown sugar, cinnamon, and butter — is packed on the tops of the apples. Then, the apple crumbles are baked in the oven for about 30 minutes. While this Apple Crumble recipe is delicious alone, I think it’s best topped with a scoop of vanilla ice cream or some whipped cream. You can even give it a drizzle of caramel sauce, which make this even more amazing. Here is the complete recipe — ready for you to print or save. 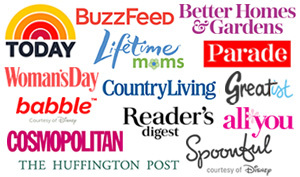 If you are on Pinterest, be sure to save it to one of your boards. In a medium sized bowl, mix together oats, flour, sugar, cinnamon, and salt. Using a pastry cutter, fork, or your fingers, work the butter pieces into the mixture. Set aside. Cut each cored and peeled apple in half. Cut each half into thin slices (no larger than 1/4″ thickness). 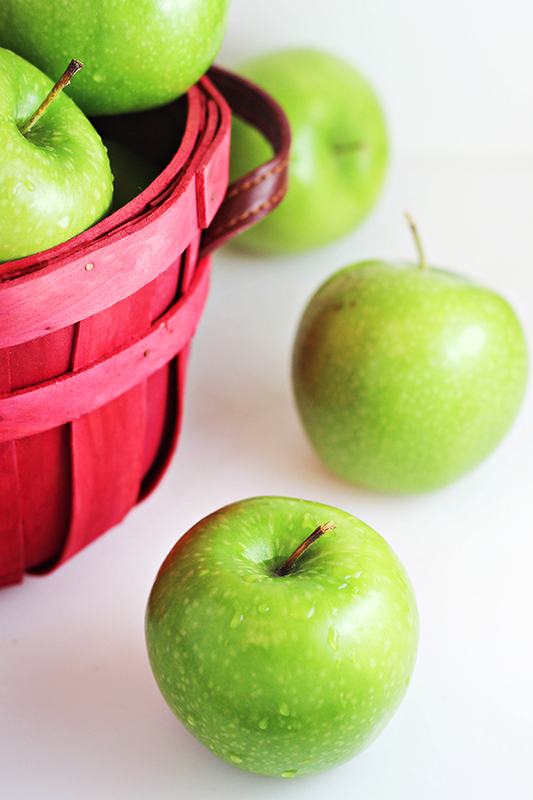 Place apple slices in a bowl and toss apples with lemon juice. Sprinkle with 1/2 cup brown sugar and toss to combine. Place canning jars on a large baking sheet. 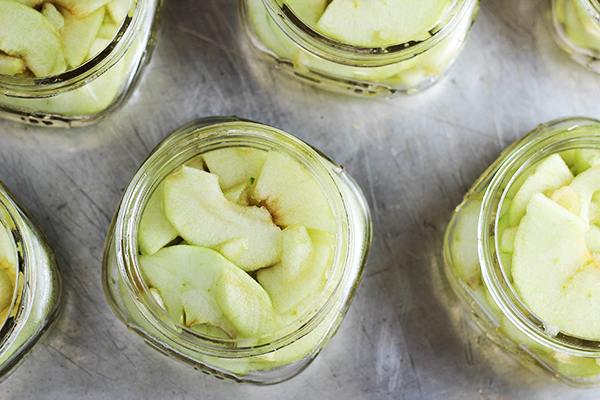 Divide apple slices among each jar. Top each jar of apples with about 1/3 cup of streusel. 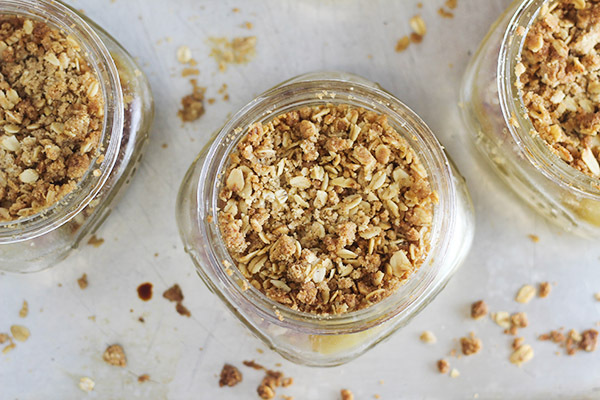 Divide any remaining streusel among all the jars. With the handle end of a spoon, press some of the streusel down into the apples. Bake for 30 minutes or until top is golden brown. Remove from oven and allow to cool. Serve slightly warm, if desired. Top with vanilla ice cream, whipped cream, and/or caramel syrup, if you wish. 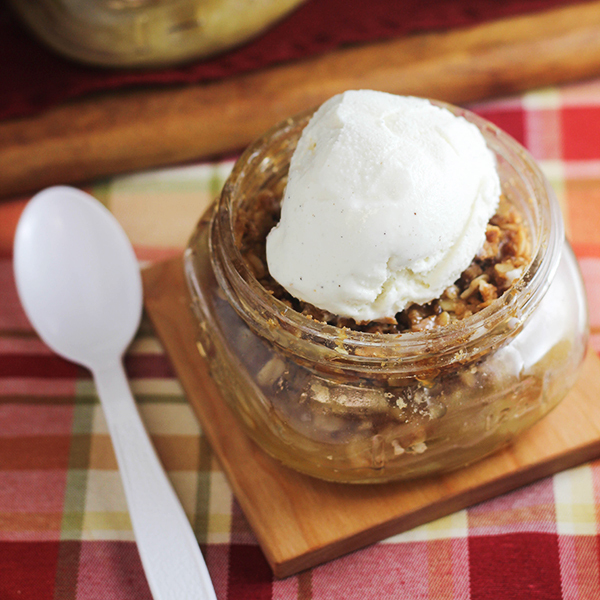 Canning jar bands and lids can be placed on cooled Apple Crumbles to save them in a refrigerator. I love those individual serving ideas – Thanks for sharing at the What’s for Dinner party! I have a board on Pinterest called Food in Mason Jars, and I am adding this to try. It looks delicious! Thanks for sharing on This is How We Roll linky party! Haven’t had it in ages! looks delicious, thanks for sharing on craft schooling Sunday! This looks fantastic 🙂 I’d like to donate a batch to a charity bake sale. Do you know if the crumble stays crisp if the lid is screwed on? Thanks! These are on the agenda for the w/end, baking w my Daisy. I am totally drooling over this right now! Yummy! Thanks for the great recipe! This would make a great holiday present for co-workers.